Heading south after Vathia, the Mani peninsula becomes even more remote, more barren (I’d not have thought it possible). It’s dotted with the occasional beautiful beach, and we stopped at one (Porto Cayo) to look, but we didn’t swim (George doesn’t have my genetic irresistible impulse to jump into any available body of water). Instead, we continued our drive down to Cape Tenero, which has the dubious distinction of being the southernmost point in continental Europe east of Spain. 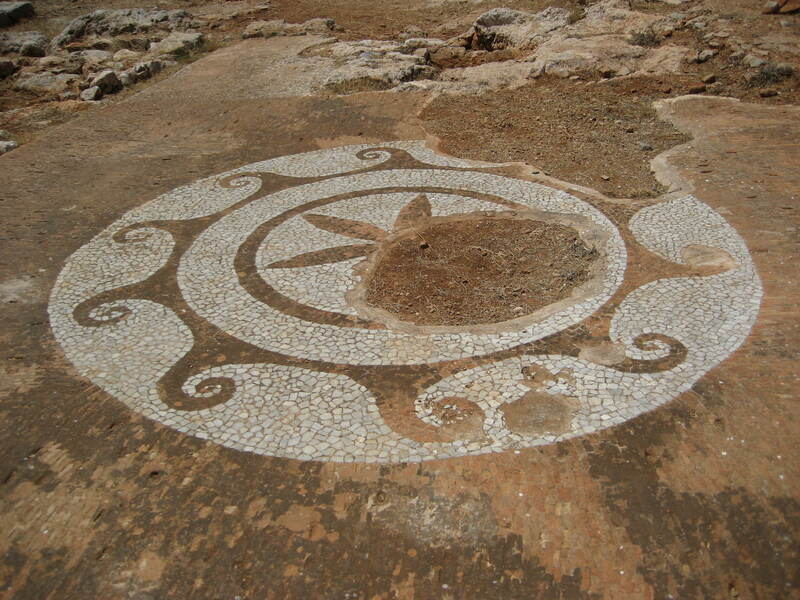 Cape Tenero also has three really cool things: a cave entrance that was once thought to be the entrance to Hades; a small temple to Poseidon; and the ruins of a Roman villa that still has spectacular floor mosaics sitting right out there in the open. I suppose I could also add Capte Tenero’s cool view to the list: rocky hillsides surrounding beautiful turquoise water. We drove up the eastern side of the Mani without any further stops, which was just as well, because I spent most of my time (1) keeping my eyes on the road (this was one of those no guard rail sections of Greece) and (2) wondering when the car was going to run out of gas. We somehow made it to Mavrovouni beach without the car dying in the middle of a remote hillside and spent a while swimming and relaxing. The trip made it full swing with a return to Gythio, where we went to get charcoal-cooked octopus. I’d been told that a trip to Laconia wouldn’t be complete without this specialty. The Greeks usually eat their octopus with ouzo – I decided that they do this so the octopus will wash away the taste of the ouzo, and the ouzo will make them forget about the texture of the octopus. I had mine without ouzo and was glad that octopus is served in small portions. 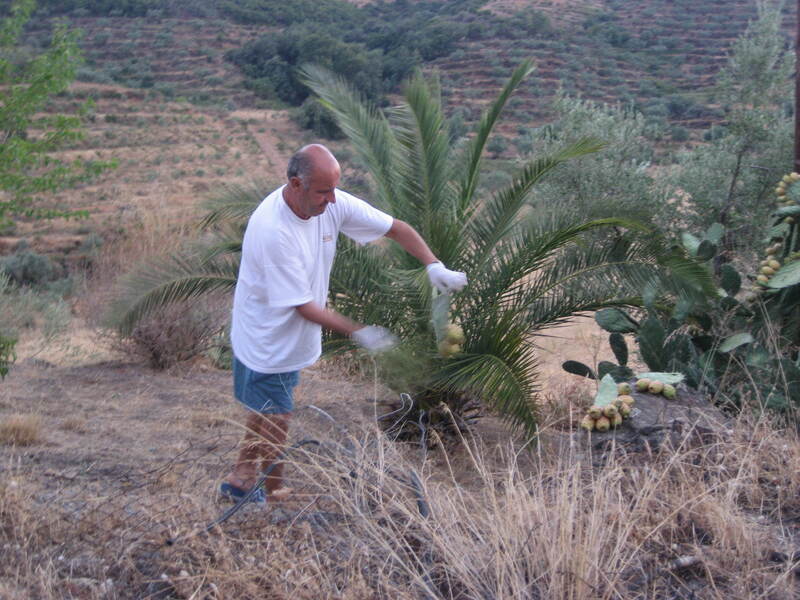 We went back to Koumani, where George had decided that I should try prickly pear cactus fruits. I went to George’s house to find him gloved as if ready for surgery, swatting at the cactus fruit with some kind of a plant to get the spines off. I ate several of the fruits – they’re refreshing on a warm evening, if not my favorite fruit – and was sent home with a plate of several more (which I squeezed into my orange juice this morning – much better than eating them whole). I finally made it to the “other tavern” in Koumani, the one owned by a man who used to live in Williamsburg, VA, for dinner. The meal, a Greek salad and fried artichokes, was excellent (when they fry food here, they don’t hide it in lots of batter – just a little bit of egg). George accompanied me, and we were eventually joined by Dimitri and then by a farmer named George (the two of them kept up quite a hilarious banter, occasionally in English but mostly in Greek). We moved onto a watermelon and grape course and ended up staying out quite late. That’s late by my standards, of course – Dimitri and George the farmer were still there when I left, and I think the other George might have been planning to go back.